Affiliated to New Zealand Dairy Goat Breeders Association Inc.
New Zealand Anglo- Nubian Cluc has members throughout both the North and South Island with the common interest of breeding quality Nubian Dairy Goats. New members are always welcomed and encouraged. Anglo- Nubians are intellegent inquisitive animals with their long pendulous ears and pronounced Roman nose being distinctive features of the breed. They make wonderful pets because of their affectionate nature and unique look. NZAN Buck Kid of the Year. HR Dam and Daughter class at Allbreeds Show1990s Claudelands. In photo L to R is ?, Diane Craw (your 2013 secretary/ treasurer), Wendy Hollart, Colin Thrupp and Greg Bush holding Ricardii Ficelle - 1st place winner. Anglo-Nubians in New Zealand are derived from the Anglo Nubian breed which originated in Britain from goats from India, Egypt and Africa. Although Anglo-Nubians sometimes can have less volume than some of the Swiss breeds, they have a much richer milk with higher butter fat content, much like the Jersey cow in the cattle breeds. Anglo- Nubians are ideal house milkers as their milk is lovely and creamy. Their slightly larger teats make hand milking easier. Our club is affiliated to the New Zealand Dairy Goat Breeders Association, although not all of our members own goats, or have not actually breed all their own goats, anybody who has an interest in the breed is most welcome to become a member. Please browse other pages on our website and if you would like more information about New Zealand Nubians or if you would like to receive the next publication of our magazine by mail please feel welcome to contact us on shiloh@ps.gen.nz. or text 022 6209345. 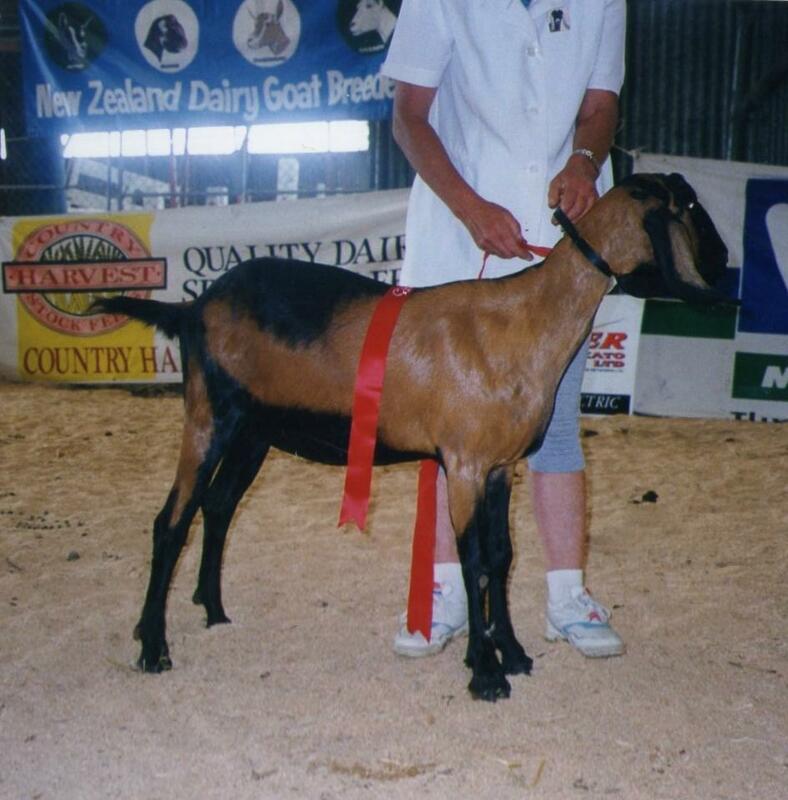 Ricardii Witchelina 1st place in AR Goatling NZ AN Breed Show 1999. See breed standard for conformation. FOR SALE - 4 CAE negative grade Nubian does all in milk. Kidded July 2013. $100.00 each. Text contact Diane 0226209345 or email. 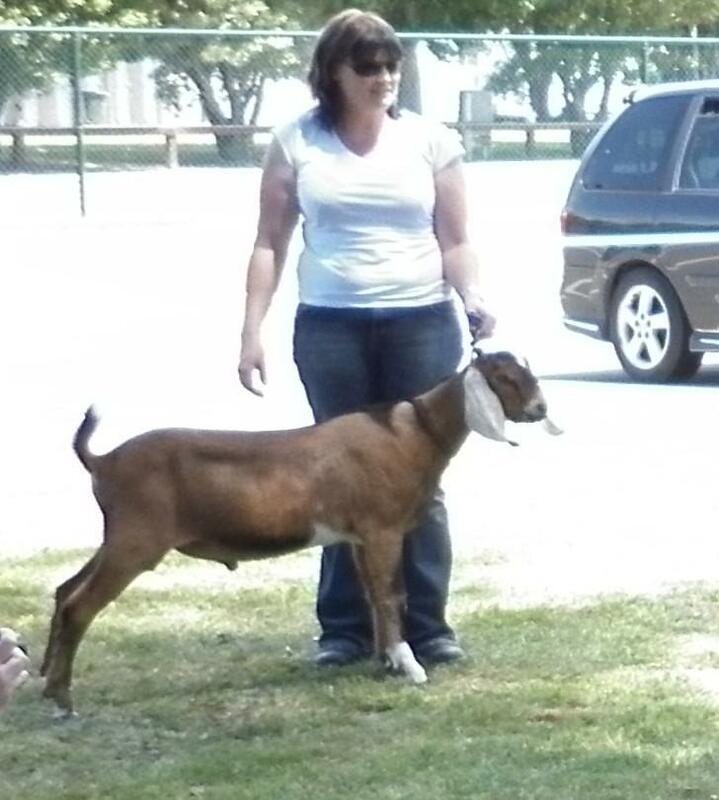 FOR SALE - 7/8 Nubian male dehorned from CAE negative doe. Suitable for using with unregistered or recorded grade does next year. He is brown with white ears. Has mottle sired. Price negotiable. Text contact Diane 0226209345 or email. WANTED - HR Buck kid, preferrably dark, from CAE negative doe with good milking lines. Text contact Diane 0226209345 or email.